Over the last six years there has been a huge resurgence in story-based point-and-click games all thanks to Telltale Games. The company got eyes with the return of Sam & Max but it turned heads with the first season of The Walking Dead. The follow-up of The Wolf Among Us kept fans hanging on for more content from Telltale Games, and with successes like Batman: The Enemy Within, many thought that the company was going to be making headway toward bigger and better things, but alas it was not meant to be. After swapping out the CEO, restructuring the entire studio and culling a lot of properties from the line-up, things still didn’t turn around for Telltale, and now the company is shutting down. 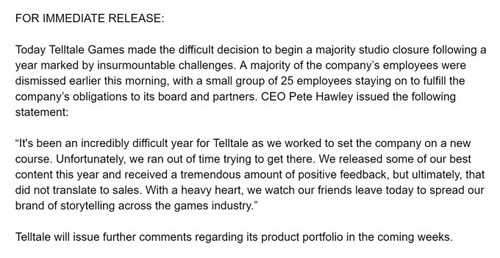 Over on the official Telltale Twitter account, the company announced that it was letting go of all its staff, save for 25 employees who will stay on to finish work on open projects. _US Gamer is reporting that everyone who was let go from the studio did so without severance pay. As for _The Talking Dead: The Final Season, the second episode is due to drop on September 28th, with the remaining episodes scheduled to arrive before 2018 wraps up. However Variety is reporting that it’s “uncertain” if the remaining episodes will release as scheduled. Additionally, there’s no guarantee that Telltale will shut down indefinitely. It could be one of those situations where the studio is looking for an angel investor or another buyer who will pick up the intellectual properties currently under the company’s developmental deal with the rights holders. This could be a reason why Telltale signed on with Netflix earlier in the year even though the company was in dire straits. Sometimes having valuable IP under the belt helps improve the overall valuation of the company and makes it look worthwhile for potential buyers. Of course, this is all assuming that Telltale won’t just file for bankruptcy and sell off all of its remaining properties in the process. This all comes after a studio restructuring last year in 2017, in which Telltale laid off 25% of its staff during a restructuring. Link to the rest at CinemaBlend and thanks to Felix, who says Telltale’s “generally acclaimed games were everything tradpub dreams to turn interactive ebooks into” for the tip. So, horror fiends, I have done the dirty work for you and screened a bunch of scary stories apps so I could bring you the best. I’d like to start this month’s editor’s musings with a personal rising-from-the-ashes anecdote. One of the other jobs I juggle alongside my role at FutureBook involves being Digital Editor for PHOENIX, a six-year-old fashion and culture magazine. At the core of PHOENIX is a bi-annual print magazine: 200-odd pages of long-form journalism on high quality paper with really nice smelling ink. It’s essentially a mini book. Ever since PHOENIX began, we’ve continually questioned what – if any – sort of digital presence the mag should have. How could we use digital to enhance, but not replicate, our physical hero product? How could we use digital to pull in new readers, whilst ensuring they converted to print sales? How could we create digital content of the same quality we’re known for in print – but with a tiny team on an even smaller budget? Yep – essentially the same questions that preoccupy the big-book trade. Two years ago, we thought we’d come up with the answer. We launched PHOENIX’s monthly counterpart, The Manual: a digital-only, custom-created magazine cradled within a bespoke app. It was interactive. It was beautiful. It was timely. Why? It seemed like such a brilliant idea at the time. But we soon came to realise that, while apps are great for functional services such as Uber or banks, they’re pretty useless when it comes to publishing. From a reader’s point of view, downloading an app is a surprisingly big barrier to entry. Not only do you have to wait a few seconds to install the app and another few seconds every time you want to download each new issue, you have to reproduce the whole process every time you want to read on a different device. And, if you want to launch an external link, its’a clumsy process that takes you outside the app – and out of your closed story-garden into a wilderness of distractions. From a publisher’s point of view, producing and distributing content via an app is a total pain – from creating complex InDesign files to working with frustrating external shopfronts such as the Apple Store. And it’s useless for SEO. Last week, Simon Rowberry wrote us a very popular – and polarising – piece called ‘Is the e-book a dead format?’ In it, he explained the growing interest around Portable Web Publications (PWP), “a self-described vision for the future of digital publishing based on a fully native representation of documents within the Open Web Platform.” His cautionary note – ” how will books cope in the complex attention economy of web browsing?” – is worth listening to. Interactive multimedia storytelling is probably older than recorded human history itself. The famous cave paintings of Lascaux, for example, date from about 17,000 years ago. While we do not know their exact purpose, one can easily imagine a narrator or shaman using them to describe a successful hunt or enact a ritual. Holding a torch, the narrator walks along the walls, recounting a sequence of events, in a kind of early form of cinema. Today, we have interactive digital narratives, also known as video games. This relatively new form of interactive media has evolved into a mature form for the presentation of narrative, and may well represent a possible future for storytelling. The first thing to know is that digital interactive storytelling has matured in recent years. The depth and quality of the writing and emotional experience in some games rivals the best literary narratives—and some are even drawn from them. The international hit Witcher 3: Wild Hunt, for example, is based on a series of novels by Polish novelist Adrzej Sapkowski, adapted for the game medium by developer CD Projekt Red’s Jakub Szamalek. Second, despite book publishers’ fears that mobile apps are a form of digital distraction, taking readers away from books, interactive digital media can actually drive readers toward text-based storytelling. Twine, for example, bridges the gap between interactive fiction and gaming; it’s an open-source software tool that allows users without programming expertise to create and publish interactive stories. Twine has become so popular that it has begun to be noticed by book publishers. In many ways, it is the digital offspring of the popular Choose Your Own Adventure book series. Because Twine is free and does not require coding skills, it has become a platform for writers who want to try their hands at interactive fiction. Many Twine games are composed entirely of text. Some are also visual, but in many cases, a branching narrative composed of text is the final published product. As this shows, gamers are open to and interested in text stories. Reading a book used to be considered a fairly straightforward experience. You opened the book (it was a print book) and you started reading. Today we have ebooks and audiobooks, which, to varying degrees, have changed our reading experiences. With an ebook, we can read that same print book on our phones, on our computers, on our tablets or on our e-reader devices. And with digital audiobooks, we can now listen on our phones to someone else read the text from that print book. I hear a lot of talk about how ebooks didn’t innovate enough, or how ebooks are unsatisfactory—that they’re stuck in this “print-under-glass” model that offers nothing new to the reading experience. I also hear about companies, both within and outside of traditional publishing, that are trying to change the reading experience, be it through new platforms or apps that bring in other forms of media or break a book down into smaller segments. Maybe I’m a bit naive, but my question is, why? Are print books and ebooks no longer effective? Do some people believe they are somehow antiquated? To that end, what is so wrong with the print-under-glass model of ebooks? What else were we expecting? To my eyes, an ebook on my Kindle looks a lot like a print book in my hands. And that’s exactly how I want it to be. The device, which is under development at the University of Michigan, uses liquid or air to fill tiny bubbles, which then pop up and create the blocks of raised dots that make up Braille. Each bubble has what is essentially a logic gate that opens or remains closed to control the flow of liquid after each command. In 1992, two debut novelists gave a joint reading at a Manhattan bookstore. One of them was Ken Siman, whose novel, “Pizza Face,” sold decently, but was hardly a blockbuster. He eventually went on to pursue a career in publishing. The other novelist was Wally Lamb. His first novel, “She’s Come Undone,” was selected for Oprah Winfrey’s book club, and went on to sell more than three million copies. Nearly 25 years later, the two have reunited to collaborate on Mr. Lamb’s sixth novel, “I’ll Take You There,” which is being released next year exclusively as a digital app by Metabook, a new e-book publishing company for which Mr. Siman is the co-founder and publisher. There are obvious downsides to releasing a book exclusively as an app. “I’ll Take You There” won’t be available in bookstores or even from e-book retailers like Amazon or Barnes & Noble when it comes out next spring. Instead, Mr. Lamb’s fans will have to buy it from the iTunes app store, and it will work only on Apple devices. Mr. Lamb said that as a music and film lover, he was excited by the prospect of enhancing a narrative with music, film clips and video. “I’m thinking to myself, wow, this is really cool, it’s something a little bit different,” he said. Interactive children’s books have become another booming genre, with everything from Dr. Seuss to an app based on Rick Riordan’s Percy Jackson & The Olympians series. But when it came to adult fiction, interactive bells and whistles often seemed like noisy distractions that pulled users out of the immersive experience of reading a story. That attitude is slowly starting to change. Some writers have created apps that allow readers to play a role in the plot or become a character. Others have developed apps that deliver tailored content depending on the reader’s geographic location. Link to the rest at The New York Times and thanks to Andy for the tip. Link to the rest at Engadget and thanks to Nirmala for the tip.